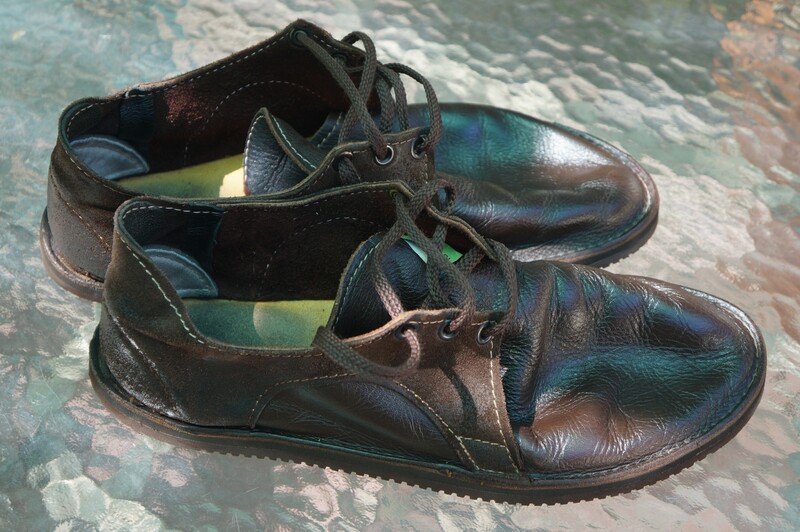 I wrote about Soft Star shoes and just bought another pair, this time the Adult Rambler – Smooth Chocolate ($85), slip-ons with elastic top, soft Vibram sole and even a soft star is sewn on. Perfect for plane flights and all day comfort with the optional sheepskin soles I ordered ($18). I paid $5 extra for USPS 1-3 day delivery and my bill was $108USD. I started seeking flat, unpadded, soft leather shoes when arthritic knuckled toes and boney growths began curtailing my walking ability. Previously, I bought New Balance padded sneakers online in wide sizes to try to soften the blows. But not only did they cost more than $100, they just didn’t work. I couldn’t walk more than a mile without pain. I found two firms that sell what I need at reasonable prices, Soft Star shoes from fabled Oregon, and Kings Trail Leather, handcrafted in Branson, MO. 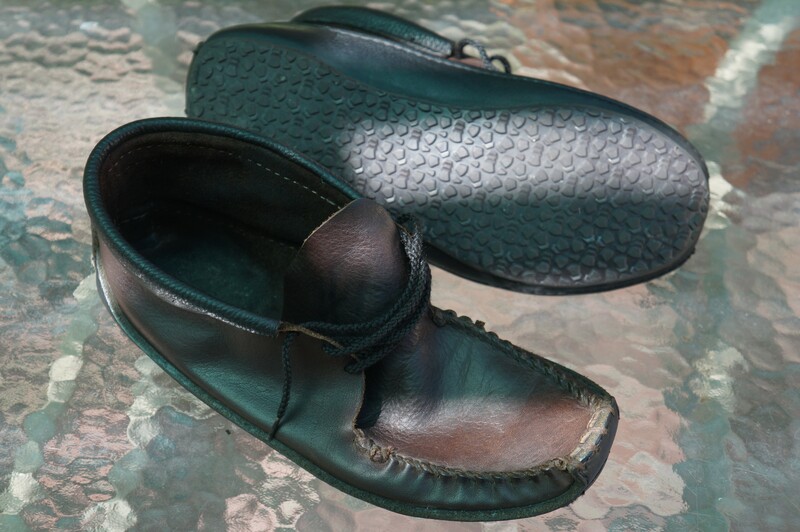 Shoes from both shops display quality you won’t see in imported sweatshop shoes, heavenly comfort where you touch the earth and a sense of style you won’t see at Walmart. They also smell great. Now I started this soft shoe quest with cowhide and bullhide soles, for comfort, light weight, esthetics and to avoid synthetics. 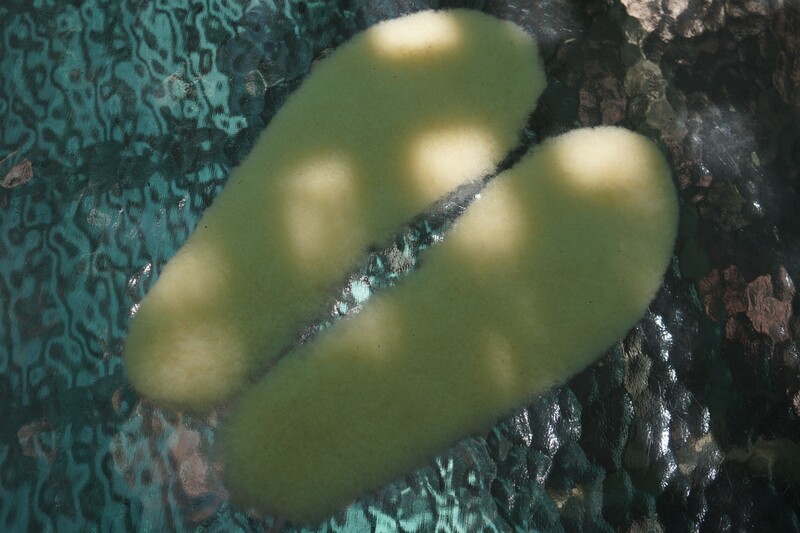 But city concrete defeated animal skin within a few years and the sole got a hole- and they are so slippery when wet. So I had my Kings Trail ‘batwing’ moccasins re-soled with this composition material by Roseville Shoe Repair, 107 S Harding, Ste J. Now they’re my utility moccasins and I can go anywhere without slipping, granted with a slight loss of comfort and gain in shoe weight and stiffness. This is the Portlander model from Soft Star I’ve had for some time. The tops’ leather is so soft and thin I was sure they’d wear out soon. 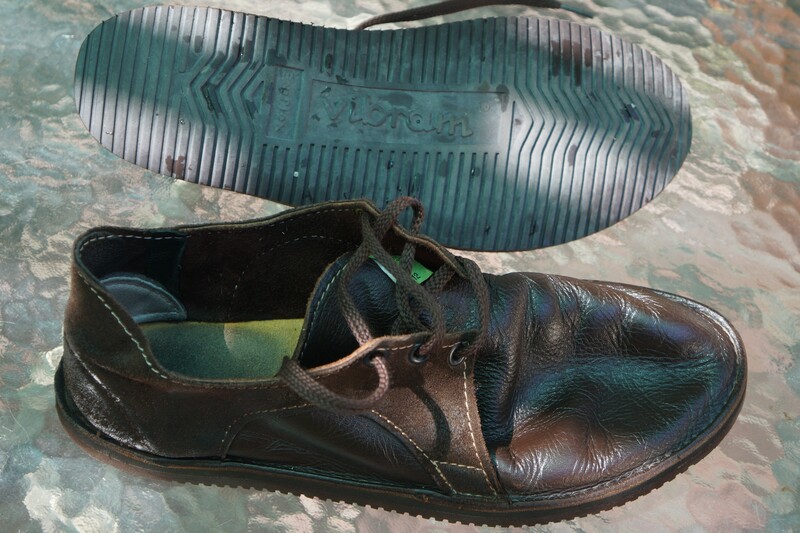 Well the tops are as good as ever but the soft and comfortable Vibram hex-pattern soles had worn out. They wore down so much I started slipping and lost some traction; and even the slight padding was lost. Roseville Shoe Repair put thicker, harder Vibram soles on them to replace the very soft original soles. This does change the nature of the shoes, making them less comfortable but more practical. The cost was $40USD for each pair. Roseville’s lucky to have a bustling, successful and competent shoe repair shop; and we’re all lucky handcrafted quality shoes can still be built and sold in the USA (and now worldwide thanks to computers, phones and the Web). 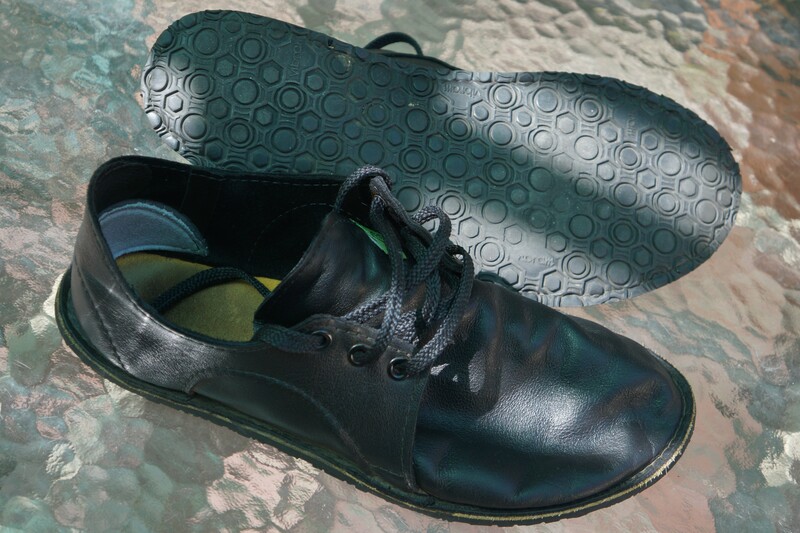 I have a pair of black Portlanders too, here is what the original soft sole looked like below. All these leather and soft synthetic soles wear in the exact shape of my bare foot and are so soft and thin that a thorn came through at Death Valley. And concrete wears even thick bullhide at a fast clip. I’m hoping the more aggressive and thicker sole shown above will help me on the next trip. Soft Star recommends (UK:recommend) you glue the sheepskin innersoles or else attach them with double sided tape to prevent bunching. I’m going to put the sheepskins in the Portlanders, and then buy more sheepskin innersoles for ALL my shoes, not cheap but maybe worth it in foot comfort. Unless otherwise noted, all text and images produced and copyrighted by todgermanica.com and are free to use with attribution. Any advertisement you see on these pages is chosen, placed and monetized by WordPress. I am neither consulted nor compensated by WordPress.